1. To make the sales or revenues necessary to cover costs and prevent a firm from operating at a loss. The breakeven may be relatively stable or it may fluctuate, depending on the company or industry. Companies with high breakevens tend to have large fluctuations in earnings from year to year. 2. To sell a security at a price that causes the seller to neither make a profit nor lose money on the sale. Fig. 11 Break-even. A supplier's typical short-run costs and revenues. Fixed costs do not vary with output and so are shown as the horizontal line FC. Total cost comprises both fixed costs and total variable costs and is shown by line TC. Total revenue rises as output and sales are expanded and is depicted by line TR. At low levels of output such as Q total costs exceed total revenues and the supplier makes a loss equal to AB. At high levels of output such as Q2 revenues exceed costs and the supplier makes a profit equal to DE. At output Q1 total revenues exactly match total costs (at C) and the supplier breaks even. the short-run rate of output and sales at which a supplier generates just enough revenue to cover his fixed and variable costs, earning neither a PROFIT nor a LOSS. 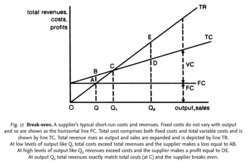 If the selling price of a product exceeds its unit VARIABLE COST then each unit of product sold will earn a CONTRIBUTION towards FIXED COSTS and profits. Once sufficient units are being sold so that their total contributions cover the supplier's fixed costs then the company breaks even. If less than the break-even sales volume is achieved then total contributions will not meet fixed costs and the supplier will make a loss. If the sales volume achieved exceeds the break-even volume, total contributions will cover the fixed costs and leave a surplus which constitutes profit. See Fig. 11. Differences in cost structures can have a significant effect upon companies' break-even points. For example, a company with low levels of automation and so little capital equipment (for example Rolls Royce cars) would have low fixed depreciation costs but high direct labour costs. With high unit direct costs relative to selling prices such a firm would have a low unit contribution but low fixed costs, so would break even at a low sales volume, though profits would climb only slowly beyond the break-even point because of low unit contribution. By contrast, a highly automated plant would have high fixed depreciation costs, but with low unit direct labour costs, would have a higher unit contribution. Firms with such plants (for example Ford) would not break even until a much higher sales volume was achieved, but thereafter profits would increase rapidly with larger unit contributions. See MARGINAL COSTING, PROFIT-VOLUME CHART. Fig. 17 Break-even. A supplier's typical short-run costs and revenues. Fixed costs do not vary with output and so are shown as the horizontal line FC. Total cost comprises both fixed costs and total variable costs and is shown by line TC. Total revenue rises as output and sales are expanded and is depicted by line TR. At low levels of output like Q, total costs exceed total revenues and the supplier makes a loss equal to AB. At high levels of output like Q2 revenues exceed costs and the supplier makes a profit equal to DE. At output Q1 total revenues exactly match total costs (at C) and the supplier breaks even. the short-run rate of output and sales at which a supplier generates just enough revenue to cover his fixed and variable costs, earning neither a PROFIT nor a LOSS. If the selling price of a product exceeds its unit VARIABLE COST, then each unit of product sold will earn a CONTRIBUTION towards FIXED COSTS and profits. Once sufficient units are being sold so that their total contributions cover the supplier's fixed costs, then the company breaks even. If less than the break-even sales volume is achieved, then total contributions will not meet fixed costs and the supplier will make a loss. If the sales volume achieved exceeds the breakeven volume, total contributions will cover the fixed costs and leave a surplus that constitutes profit. The two methods to calculate the break-even point are the equation method and contribution method. Based on our detailed macroeconomic framework for the GCC countries, we expect fiscal break-even oil prices to decline further in the coming years," said Garbis Iradian, chief economist for the Middle East & North Africa at the Institute of International Finance (IIF). If your average product sale is $400, divide the total sales break-even figure of $50,000 by your average sale of $100 to come up with a figure of 500 units to break even. According to Deutsche Bank's calculations, break-even oil prices of both Saudi Arabia and the UAE have fallen for the first time in the past few years. Yet energy economists studying oil markets are tempted to approach fiscal break-even analysis with the feeling that it could shed more light on producers' production policy, said the report. Our next goal is full break-even in 2011, leading to sustainable profitability from 2012 onwards. 15 November 2010 - Danish medical research services provider Exiqon A/S (CPH: EXQ) forecast today its EBITDA will reach break-even in 2011 as sales are expected to grow. NORDIC BUSINESS REPORT-November 15, 2010--Exiqon guides for EBITDA break-even in 2011(C)2010 M2 COMMUNICATIONS http://www. The outlook may be revised to "positive", if TDN increases its subscriber base more than expected and achieves break-even earlier than expected. Unlike in the previously covered long call, bull call spread and covered call strategies, straddles have two break-even (no profit, no loss) points. In addition, the strategy brings down the break-even point (no profit, no loss) and, hence, minimises the risk. The results show that the break-even probability will be relatively high in some circumstances, suggesting that the benefits of a Roth account likely outweigh the possible future tax, were Congress to renege. What if Congress reneges on Roths?